FREE printable luggage tags for the kids when you sign up for our newsletter! Plus we share our best travel tips! Zip Lining, surfing and seeing sloths are some of the fun things to do in Manuel Antonio with kids. This area of Costa Rica has the best of both worlds, beautiful beaches and rainforests filled with sloths, monkeys, lizards, toucans and more! There are lots of interesting activities to choose from. 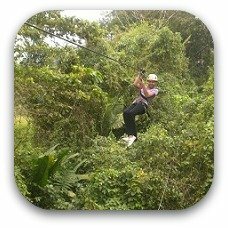 Teenagers will love flying down the Superman Zipline, children will have a great time on the Kids Saving The Rainforest Tour. Toddlers and little ones will love playing in the sand on the beach. Cultural Activities + Word Searches + Colouring Pages + Fun Travel Quizzes & More! 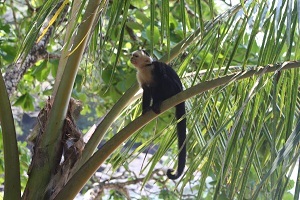 A visit to Manuel Antonio National Park is one of the best things to do in Manuel Antonio with kids. Be sure to hire a guide to help you find all the wildlife hiding in the trees. If you don't have a guide you are probably only going to see a bunch of trees! Most guides will have a scope so you can see the animals and birds up close. You can also get great photos if you have a regular digital camera as you can take photos through the scope this way. You can easily hire a private guide or join a small group with a guide at the entrance. My children and I saw the 2 and 3 toed sloths, howler monkeys, white-faced monkeys, iguanas, brown vine snake, a toucan, raccoon, crab, deer and lots of colorful birds. There is a beach located inside the park that is great for kids as it is very calm. Be sure to bring your swim suits! Watch your bags at the beach as the cheeky monkeys know how to unzip the zippers! Your entrance ticket is for the full day so you can head for lunch in town and return to the beach if you wish. (Kids under 12 free). Relax on the beach in Manuel Antonio. Toddlers and small children will have a great time building sandcastles. Your older kids will love swimming in the water and watching the surfers. You can also rent boogie boards here.This beach can have rip currents so be sure to check the warnings posted at the beach. There are vendors offering beach chairs and umbrellas for rent, as well as vendors selling drinks and souvenirs. There is a calm beach inside Manuel Antonio National Park that is great for kids but you will have to pay the entrance fee to the park (kids under 12 free). Go white water rafting with the kids on nearby Savegre River. The rapids are class II-III making them ideal for families. 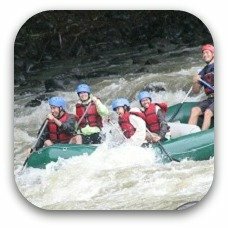 Have fun paddling through the rapids as you enjoy the beautiful Costa Rica scenery. Ages 5 and up. Horseback Riding is another one of the fun things to do in Manuel Antonio with children. Ride on the beaches or through the picturesque countryside of Costa Rica. There are several ranches in the area offering these tours. 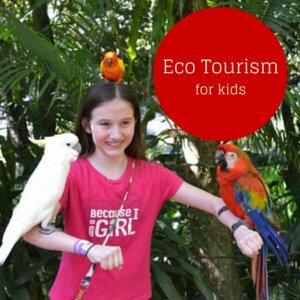 The Kids Saving The Rainforest Tour is one of the best things to do in Manuel Antonio with kids. 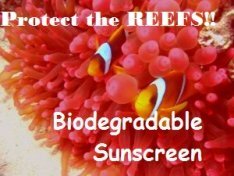 This organization was started by a 9-year-old girl who was living in Costa Rica and wanted to help save the rainforest. This educational and fun tour starts at Mono Azul hotel with a presentation about the organization. This includes some fun games for the kids and videos of some of the animals they have rescued. 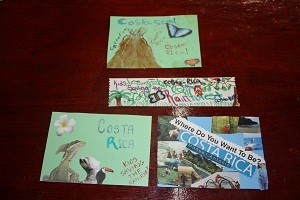 Next your children will make a postcard or bookmark to be sold in the souvenir shop where all proceeds go to the organization. Next you will head out to the animal sanctuary located at the gorgeous Blue Banyan Inn where you can see the marmosets and spider monkeys. Your kids can feed them a worm or two! Your family will be able to explore their organic farm and taste some of the exotic fruits! 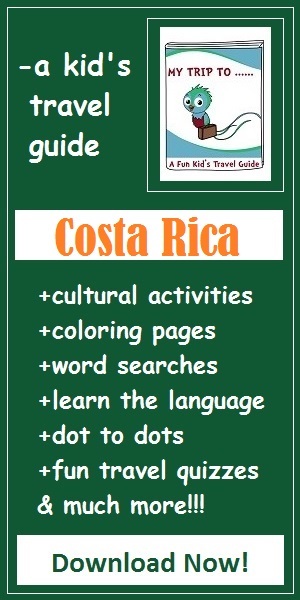 We did this tour and it was one of our favorite activities that we did in Costa Rica. Be sure to book this tour ahead of time so they can arrange with Pia, the friendly veterinarian to show you around. You can add dinner on to your tour at Mono Azul hotel- we ate here and all agreed the food was delicious!! Take a tour of Fincas Naturales Wildlife Reserve. Enjoy a guided tour through the trails of the refuge. Toddlers will love seeing the colorful butterflies in the butterfly atrium. Children will be entertained as they check out the different frogs in the amphibian aquatic garden. And don't miss out on the turtles, snakes and crocodiles. Enjoy a mangrove boat tour. Catch a glimpse of the plentiful wildlife that hangs out here. Children will have fun searching for monkeys, anteaters, crocodiles, snakes, birds and more. This is a great tour for toddlers and small children. Have lunch or dinner at El Avion. This C-123 airplane has been converted into a restaurant serving up delicious food and drinks. Learn about the scandalous history of this aircraft and its role in the Iran-Contra affair. This is one of the unique things to do in Manuel Antonio with kids. Where else can you enjoy a meal in paradise inside a cargo plane used in one of the biggest scandals in history? 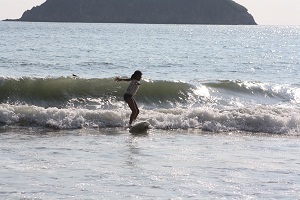 Learning to surf is one of the fun things to do in Manuel Antonio with kids. There are several companies offering official surf lessons for kids ages 7 and up. Or do what we did and head to Manuel Antonio beach and negotiate for a couple hours of surf lessons for the family with one of the local surfers. My kids were all able to stand for a few seconds and ride the waves. They loved this! You can rent bikes in Quepos with your older kids and teenagers (no kids bikes) from the local tour operators for the day or a few hours. We did this on a Sunday when most business were closed so the streets were quieter. We rode along the top road for great views along the water. We explored the side streets and stopped for a fresh fruit smoothie. Don't miss out on a night hike in the rainforest. Grab a flashlight and join your guide as you discover the jungle night life. They are a noisy bunch! Your kids will love searching for frogs, snakes and even glowing beetles. One of the best things to do in Manuel Antonio with your family in the evening. Ages 6 and up. Explore the beautiful Costa Rican countryside on an ATV Tour. This exciting ride is one of the fun way to see the rainforest! Children can ride on the back of the ATV with a parent driving. Minimum age to drive is 16. 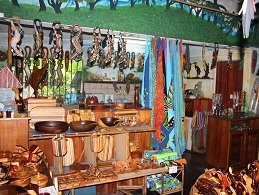 Be sure to do some souvenir shopping while in Manuel Antonio. There are markets and stores offering shirts, towels, magnets, paintings and more! The best place to get souvenirs is at the Mono Azul hotel where the Kids Saving the Rainforest Headquarters is located. All proceeds from the souvenir shop go to the organization. They have great souvenirs including kids books about the rainforest, stuffed animals, puzzles and nice wooden carvings! 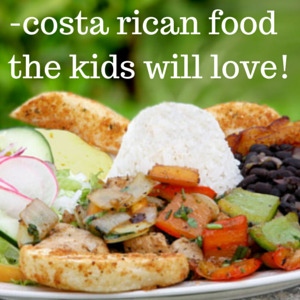 Sampling the delicious Costa Rica food will be one of the highlights of your trip. 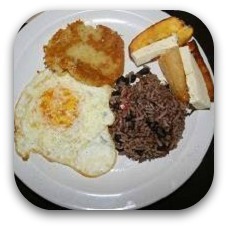 Start the day with some hearty gallo pinto (black beans and rice). Have lunch at a local soda where you can enjoy meats, rice and beans or some lovely fried plantain. Children will love trying the fresh fruits here- papaya, mango, pineapple and melon! Take a family yoga class. Experience a fun yoga class where you will stretch, play and exercise with the kids. What better place to learn the benefits of yoga then in beautiful Costa Rica! Beginners welcome. This is one of the unique things to do in Manuel Antonio on your family trip! The kids will love ziplining in the rainforest. This is one of the top things to do in Manuel Antonio with kids. Midworld has one of the best canopy tours for kids. It has 10 cables, 2 rappels and a treetop suspension bridge. They use dual cables for extra security. Ages 4 and up. 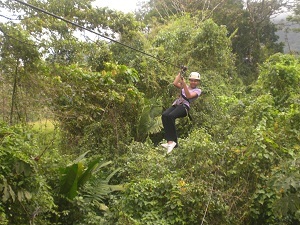 Your teenagers will love the Superman Zipline here-it is the longest in Costa Rica at over 1 km!!! Ages 12 and up. Also great for teenagers is the high ropes course with monkey bridges, rappels, bridges and more. Recommended for ages 12 and up. Oneof the best things to do in Manuel Antonio with kids! Titi Canopy Tour offers 12 zip line cables up to 450 metres long. They also have a butterfly garden here. You can even do a night time canopy tour-great for your little daredevils! Canopy Safari has 10 cables as well as 2 rappel lines and a Tarzan Swing. This canopy tour has slower zip lines so is great for younger children. The tour also includes a visit to the butterfly farm and serpentarium. The kids will love seeing the colorful butterflies and dreaded Fer De Lance snake. Dream Forest Canopy is available for kids ages 4 and up. There are 9 cables including a 600 meter cable (one of the longest ziplines in Manuel Antonio). ADR Adventure Park offers a combination package including canopy zip line, waterfall rappel, tarzan swing and free fall into a river pool. This thrilling tour is great for your adventurous children ages 8 and up! Your teenagers will love this place! 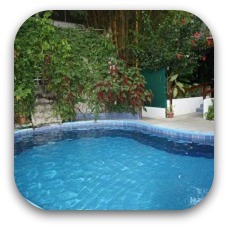 What are your favourtite things to do in Manuel Antonio? Delicous food your whole family will love! 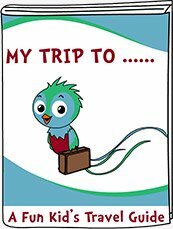 Kid's Travel Activity Packs for 35 countries! 2 age ranges! 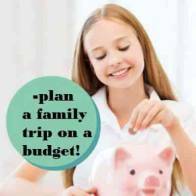 We strive to keep Family Travel Scoop up to date with the latest information for family travellers. If you see any information that is missing our outdated please email us at helen@family-travel-scoop.com to let us know! We are two family travel bloggers! We are sisters who love to travel. The travel bug started for us when we moved to Japan (from Canada) for 2 years when we were kids . It was an amazing experience and we were fortunate enough to travel to many other countries in Asia while we were there. Our parents ran a family travel agency while we were growing up so we had the inside scoop on how the travel industry works. 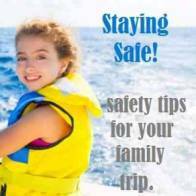 Love to travel with your kids? 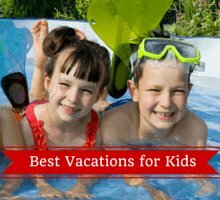 Get the inside scoop with cool family destinations and amazing travel tips.